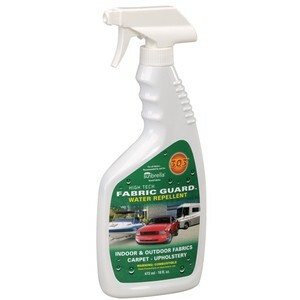 303's Fabric Guard is perfect for restoring water repellency to your boats marine canvas. The 303 Fabric Guard will help stop leaks, protect against soiling and both oil & water based stains. It will also help fight against mildew and UV sun damage. Simply spray on the 303 Fabric Guard on to your boats canvas and let it dry. Treats approx. 75-100 sq. ft. of Marine canvass.